I've taken the evening off, and spent it on going through some of this weekend's photos. As the heading might give away, the weather wasn't at it's best Sunday. We had intentions of taking Sebastian to Fløyen, but could not see the top through the snow and clouds. We figured it was best if we postponed the trip to a weekend with better conditions. 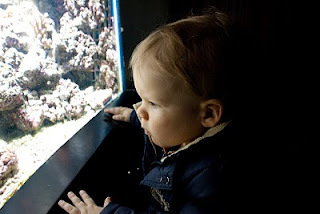 But here we were, at home, with "nothing" to do and a boy full of energy :) We decided to give the Aquarium of Bergen a shot. And what a hit! They've got fish (of course), penguins, monkeys, snakes, alligators and more. Sebastian was absolutely thrilled (as you might see from the photo) and he was singing to himself all the way home (after being fed with Norwegian waffles for afternoon snack). Dad brought the camera along, and captured what he could on the way. There are, by the way a few new shots of Sebastian in the "second year" album over at photos.rundtomrundt.com, if you have access.